United Nations climate chief Christiana Figueres plans to announce her candidacy to be the next U.N. secretary-general, E&E has learned. Figueres, who orchestrated a historic global climate change accord in Paris last year, steps down next month as head of the U.N. Framework Convention on Climate Change. She declined through a spokesman to comment, but multiple sources confirmed that Figueres intends to formally declare her interest in replacing U.N. Secretary-General Ban Ki-moon on July 7. "She is definitely throwing her hat in the ring for secretary-general," one person with direct knowledge of Figueres' plans said. Christiana Figueres in 2011. Photo courtesy of UNclimatechange. Ban's term ends in December, and so far, 11 candidates are openly vying for the position of the world's top diplomat. 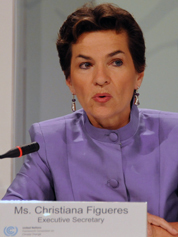 Sources say Figueres in floating her candidacy has reached out to the diplomatic community, funders and the CEOs of major companies like Unilever and Ikea that played a major role in delivering climate commitments for the Paris deal. Hers would be a dark-horse candidacy, many people noted. A longtime Costa Rican diplomat from a political family -- her father, José Figueres Ferrer, was thrice elected president of Costa Rica -- Figueres nonetheless has little of the national security chops traditionally sought in a top U.N. leader. Her resume also falls short in some other major U.N. focus areas like humanitarian aid and peacekeeping. But admirers also describe Figueres, the face of the United Nations' most successful recent venture, as a dynamic leader who would bring new energy to the position. She also could be counted on to make implementing the Paris Agreement a global priority. "The traditional, almost exclusive focus on peace and security credentials is a historic legacy of the past that needs to be broadened to include the new functions of the secretary-general, which have grown with every passing year," said Robert Orr, a U.N. undersecretary-general and special adviser to Ban on climate change. Orr said Figueres' presence in the race would be "healthy" because it would put climate change "front and center" as an issue that candidates for the job would be questioned about and evaluated on. "Until now, it's been virtually absent," he said. János Pásztor, Ban's senior adviser on climate change, said it is critical for the next secretary-general to make global warming a top priority. "If the next secretary-general does not prioritize climate change, the world will lose a person who can regularly remind government as well as non-state-actor leaders about their opportunities and their responsibilities for ambitious implementation of the Paris Agreement, a person who can engage the heads of U.N. agencies to support member states in their implementation of the Paris Agreement, and one key leader who has not stopped reminding the world of the importance and urgency of acting on climate change," he said. The process for selecting a successor to Ban is already skewed toward issues of global security. The U.N. Security Council will make recommendations to its General Assembly, which will then choose a candidate. A decision is expected to come down in October. This year's process is touted as the most open and democratic in history, but the Security Council still has disproportionate influence over the process. Any successful candidate must have the approval of its five permanent members: Russia, the United Kingdom, France, China and the United States.